As a marketing executive, I’m accustomed to the process of segmenting markets. My software companies divided markets by company size, SIC code, geography, and installed software. By doing so, we could identify and communicate with companies that were most likely to buy our products and services. The Pew Research Center has done something similar with America’s body politic. Rather than two major political parties, Pew identifies eight different clusters of political thought and action: four for the Left and four for the Right. Let’s take a look at each. (Click here for the complete report and here for a Q&A on the methodology). 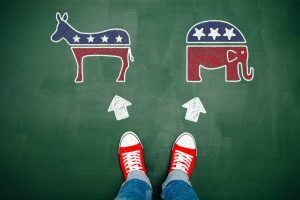 Core Conservatives support traditional Republican positions including smaller government and lower taxes. They also believe that the nation’s economic system is fundamentally fair. Core Conservatives generally support globalization, believing that the global economy creates opportunities for American businesses. This segment accounts for approximately 31% of all Republicans and roughly 13% of the American body politic. Country First Conservatives are deeply concerned about immigration and generally believe that America should withdraw from the world. They strongly believe that the global economy is deeply threatening to American interests. More than any other segment, Country First Conservatives agree with the statement “If America is too open to people from all over the world, we risk losing our identity as a nation.” This segment accounts for 14% of Republicans and 6% of the American public. Market Skeptic Republicans share many conservative values but are losing faith in the American economic system. They believe the economy unfairly favors powerful interests and are skeptical of banks and other financial institutions. More than any other group, the disagree with the statement “The U.S. economic system is generally fair to most Americans.” This segment accounts for 22% of Republicans and roughly 12% percent of the American public. New Era Enterprisers form the most optimistic segment of either the Right or the Left. More than any other group they believe that the next generation of Americans will be better off than the current generation. New Era Enterprisers strongly support business and generally believe that immigrants strengthen the country. This segment makes up 17% of Republicans and 11% of the general public. Adding it up (with some rounding errors), the four Conservative segments account for approximately 42% of the American body politic. Solid Liberals have liberal attitudes across the board. They overwhelmingly support government involvement in health insurance and government activism to ensure that blacks have equal rights with whites. They support government regulation of business and don’t believe one needs to be religious to be moral. Solid Liberals account for 16% of the general public 33% of Democrats. Opportunity Democrats agree on many policy issues with Solid Liberals. They’re more likely, however, to be pro-business and to believe that most people can get ahead if they work hard. They comprise 12% of the general public and roughly 20% of Democrats. Disaffected Democrats are positive about the Democratic Party but cynical about government in general. This is one of two minority-majority segments. They support activist government programs and believe that we should focus less on problems abroad and more on domestic issues. Disaffected Democrats account for 14% of the general public and 23% of Democrats. Devout and Diverse is the second minority-majority segment. Like Disaffected Democrats, they face financial hardships. Among all the groups, this segment is the least politically engaged. They resist government regulation and strongly believe that one needs to believe in God to be moral. The Devout and Diverse account for 9% of the public and 11% of Democrats. Adding it up, the four Liberal segments account for roughly 51% of the American body politic. So if Conservatives account for 42% and Liberals for 51% of the general public, where are the rest of our voters? According to Pew, roughly 8% of the general public are Bystanders, described as a “relatively young, largely minority group” that is “missing in action politically”. So where do you stand? Thanks to the Pew Research Center, you can now find out. Pew has published the Political Typology Quiz. Click here, answer a series of questions, and you can figure out which group most closely represents your worldview. I’ll be writing more about this in the future. You may want to know which group you’re in to follow along.